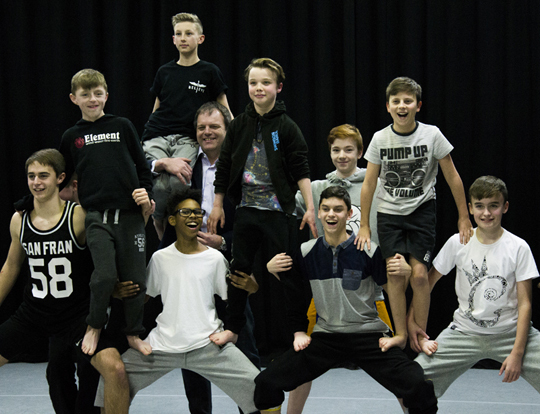 Pebley Beach, Bridgemead-based car dealership and vehicle workshop, is supporting Swindon Dance to create a school-based tour and workshop programme, especially for boys. STEREOTYPE (for ages 11-16 years) is one of two dance classes offered just to boys at Swindon Dance, which is based at the former town hall in Swindon, next to Central Library). D-Boyz caters for ages seven to 10. Both classes give boys a chance to find their feet if they are anxious about joining a mixed class, and are led by one of the country’s leading male dance teachers, Merville Jones. Swindon Dance is internationally renowned for providing excellent dance training – whether it is for the next Diversity dance group or for local people who simply enjoy moving their bodies to music under the guidance of great teachers. Pebley’s support will be used to take dancers from STEREOTYPE into one primary school and three secondary schools. Pebley has given Swindon Dance £3,000 in cash plus the same again in marketing expertise. The project’s marketing is a joint effort between Pebley Beach and Marlborough-based Secret Agent Marketing, who are donating time on top of Pebley’s subsidy. This entry was posted in Business, Dance, Young people. Bookmark the permalink.